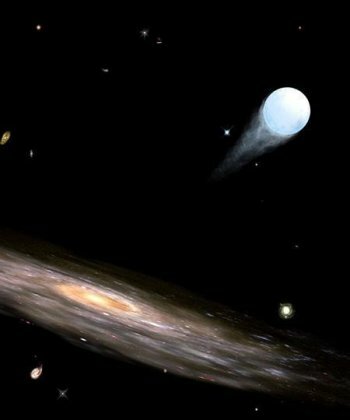 A hypervelocity star escaping from our galaxy. Artwork: Ruth Bazinet, CfA. A hypervelocity star is a star that is ejected at very high velocity (on the order of 1,000 kilometers per second) from the center of a galaxy due to interaction with a massive central black hole. The existence of hypervelocity stars was first proposed in 1988. Computer models indicated that hypervelocity stars ought to be a natural consequence of binary stars coming close to the supermassive black hole known to exist at the heart of our own Milky Way Galaxy. When a binary swings too close to the central black hole, the intense gravity can tear the binary apart, capturing one star while violently flinging the other outward at enormous speed. In 2005, the first hypervelocity star was discovered by astronomers using the Multiple Mirror Telescope in Arizona. Known as SDSS J090745.0+024507, it is 71 kiloparsecs from the Sun and moving through the outskirts of the galaxy – the so-called galactic halo – at about 850 kilometers per second (528 miles per second). This is more than twice the velocity needed to escape the Milky Way. SDSS J090745.0+024507 is expected to leave the galaxy altogether within 80 to 100 million years. European groups subsequently identified two more hypervelocity stars, one of which may have originated in a neighboring galaxy, the Large Magellanic Cloud. In January 2006, the discovery of two more such objects was announced by the Arizona group, bringing the total number of known stellar exiles to five. The two most recently discovered hypervelocity stars are both short-lived types, about four times more massive than the Sun. One lies in the direction of the constellation Ursa Major and is designated SDSS J091301.0+305120. It is traveling out of the galaxy at a speed of about 556 kilometers per second (1.25 million mph) and is currently located about 240,000 light-years from us. The other, in the direction of the constellation Cancer, is designated SDSS J091759.5+672238. It is moving outward at 639 kilometers per second (1.43 million mph) and is presently about 180,000 light-years away. Astronomers estimate that a star is thrown from the galactic center every 100,000 years on average and that altogether there are about 1,000 hypervelocity stars heading out of the Galaxy. Finding them, however, among a stellar population that exceeds 100 billion is not easy. Hypervelocity stars are becoming important tools for understanding massive black holes and also offer a unique probe of galactic structure. During their lifetime, these stars travel across most of the Galaxy. By measuring their movements across the sky, it ought to possible to refine our knowledge of the shape of the Milky Way and about the way its dark matter is distributed.